The Thunderbird Twin Zip Line awaits you! Your adrenaline really begins to pump in anticipation as you leave the 50ft tower of the Thunderbird Nest, anticipating a vertical drop of 287 feet. Next you and a friend are soaring for a half mile, one of the longest zip spans in Ontario at speeds of up to 50 km per hour. Thunderbird’s new technology allows the rider to control their own speed and even stop and enjoy the views while suspended over the Escarpment. On a clear day you’ll see Collingwood, Blue Mountains, Wasaga Beach… even Christian Island and beyond! The Thunderbird Twin Zip Line adventure also includes access to the Suspension Bridge with panoramic views of 10,000 square kilometers of beautiful countryside and the deep blue expanse of Georgian Bay over 300 metres below. Thunderbird riders must be 10 years of age or older and height/weight restrictions apply.The Thunderbird Twin Zip Line package includes all day access to a self-guided tour of caves, nature trails, suspension bridge, adventure playground, trout pond and picnic area. Please see website for spring/summer/fall operating schedule. Reservations are not required. Experience a kaleidoscope of passing panoramic scenery from the top of the escarpment to the valley below. Guests must meet all three restrictions: height, weight and age. Height & Weight restrictions: Height- minimum 48″ tall (4 feet) to maximum 82″ tall (6 foot 10 inches) ;Weight- minimum 50 lbs to a maximum 260 lbs. Age Restrictions: Riders must be at least 10 yrs. old. Youth ages 10-15 must ride zipline with an adult. All guests must pass a short demo and training session before riding the Thunderbird. Reservations are not required. Ticket sales for the Thunderbird Twin Zip close earlier than general park admission. Twin Zip Line operates weather-permitting. It may be closed due to thunderstorms, heavy winds and rain. Running/hiking shoes are required (must be closed toe shoe). 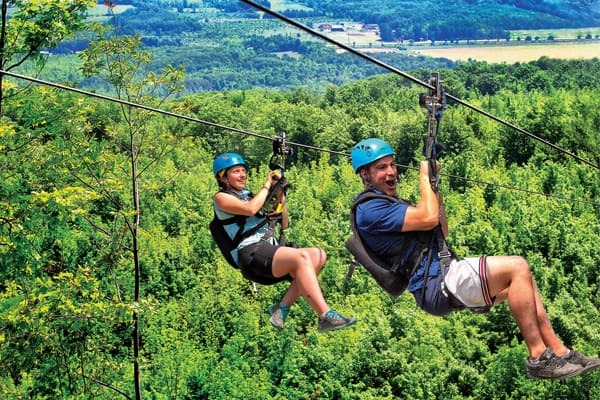 Thunderbird Twin Zip Line Package includes Park admission to caves and suspension bridge. It is not available as a separate activity. Eco Adventure guests may purchase a Twin Zip ride at an additional special rate. Eco guests may purchase Twin Zip tickets at the Eco Cabin when they check-in. Additional Twin Zip rides may be purchased after park admission. Thunderbird Twin Zip operates from Spring to Fall. The Thunderbird Twin Zip Line is our newest development. The Twin Zip is located at the highest point of the Niagara escarpment. The adventure begins with a hike along the main trail. You can either explore the caves and caverns first, or hike straight to the Thunderbird Nest. Your Twin Zip experience starts with an introduction to the ZipTour® equipment brief training demonstration session and at the rustic “Look Out” cabin. You walk up a steep spiral metal staircase of the 50 ft. tower to the Thunderbird Nest. There are side-by-side cables for the entire ride and rider-controlled ZipTour® trolleys, which allow each rider to control their own speed. The adrenaline really begins to pump, as you pull the handle down to freely become airborne. Next, you and a friend are flying where only birds can fly. The tree tops whiz by as you soar like a Thunderbird. On clear days, you will see magnificent views of southern Georgian Bay…Collingwood, the Blue Mountains, Wasaga Beach, even Christian Island and beyond. Experiencing the ride with friends and family is an incredible thrill! This attraction was designed and built by Zip Rider Inc. www.ziptour.com. Several years in the planning, the new Thunderbird Twin Zip line completed construction in July 2012. There are two things that distinguish the ZipTour® from every other zip line product: the company builds the biggest ride spans in the world, and the patented “dynamically-controllable” ZipTour® trolley allows each rider to control their zip line ride speed. There are many zip line options around the globe but, until now, there has never been the technology in place that allows the participant to control their ride and enjoy a moment suspended over the Escarpment to savour the view.